Media Contacts: Kingston Reif, director for disarmament policy, (202) 463-8270 ext. 104; Daryl G. Kimball, executive director, (202) 463-8270 ext. 107. (Washington, D.C.) – A new study published by the Congressional Budget Office (CBO) Tuesday highlights the skyrocketing cost of the current plan to sustain and upgrade U.S. nuclear forces and outlines several pragmatic options to maintain a credible, formidable deterrent at less cost. CBO estimates that sustaining and upgrading U.S. nuclear forces will cost taxpayers $1.24 trillion in inflation-adjusted dollars between fiscal years 2017 and 2046. When the effects of inflation are included, we project that the 30-year cost will exceed $1.5 trillion. These figures are significantly higher than the previously reported estimates of roughly $1 trillion. The CBO study comes amid reports that the Trump administration’s Nuclear Posture Review, which is slated for completion by the end of the year, could propose new types of nuclear weapons and increase their role in U.S. policy. The Unaffordable Arsenal, Reducing the Costs of the Bloated U.S. Nuclear Stockpile, An Arms Control Association Report, Oct. 2014. The Trillion (and a Half) Dollar Triad? Analysis of budget figures released by the Pentagon suggest that the total 30-year cost could approach and perhaps even exceed $1.5 trillion when including the effects of inflation. This is 50 percent more than the commonly cited estimate of roughly $1 trillion. Amid an escalating exchange of threats between the United States and North Korea, President Donald Trump claimed in a tweet Aug. 9 that his “first order as President was to renovate and modernize our nuclear arsenal. It is now far stronger and more powerful than ever before.” He reiterated this claim in a press briefing Aug. 11. Like many of the president’s utterances, these assertions don’t come close to resembling the truth. The U.S. nuclear arsenal is no more, or less, powerful than when Trump took office Jan. 20. The president did order the Pentagon to conduct a Nuclear Posture Review (NPR) to examine and provide recommendations on U.S. nuclear weapons policy and posture, but that review, which officially began in April, is still ongoing and won’t be completed until the end of this year at the earliest. In fact, it was President Barack Obama that set in motion plans to undertake a massive and costly rebuild of the arsenal. Much of this effort is still in its infancy, and will take decades to complete. Trump inherited this program, and his first budget request, which has yet to be acted on by Congress, proposes to move full steam ahead with the Obama approach. This is not surprising, given that the administration has yet to put its own stamp on U.S. nuclear policy. What has been lost in much of the important fact checking of Trump’s erroneous (and dangerous) nuclear saber-rattling is that while the capability of the U.S. nuclear arsenal hasn’t changed over the past seven months, the projected annual costs of the current all-of-the-above upgrade plans are rising significantly—and not because of anything Trump has done. A Congressional Budget Office (CBO) report in February estimates that the United States will spend $400 billion on nuclear weapons from fiscal year 2017-2026. That is an increase of $52 billion, or 15 percent, from the CBO’s previous 10-year estimate of $348 billion, which was published in January 2015. The 10-year estimate captures the beginning of the major planned ramp-up in spending to recapitalize all three legs of the existing nuclear “triad” of submarines, missiles, and bombers and their associated warheads and supporting infrastructure, but even larger bills are still to come. How large? Analysis of budget figures recently released by the Pentagon suggest that, even though the Trump administration has yet to make any significant changes to the Obama administration’s spending plans, the total 30-year cost could approach and perhaps even exceed $1.5 trillion when including the effects of inflation. This is 50 percent more than the commonly cited estimate of roughly $1 trillion. If the forthcoming Nuclear Posture Review by the administration does not reshape the current nuclear weapons spending plans—or worse, accelerates or expands upon them—the massive spending on nuclear weapons will pose a major threat to other high priority national security programs, to say nothing about Trump’s pledge to expand the non-nuclear military. 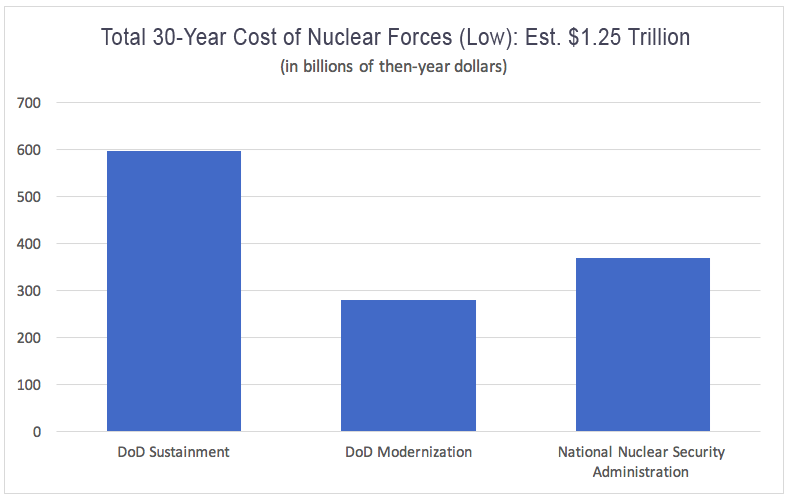 What makes the growing cost to sustain the nuclear mission so worrisome for military planners is that costs are scheduled to peak during the mid-2020s and overlap with large increases in projected spending on conventional weapon system modernization programs. Numerous Pentagon officials and outside experts have warned about the affordability problem posed by the current approach and that it cannot be sustained without significant and sustained increases to defense spending or cuts to other military priorities. Trump has declared his ambition to “greatly strengthen and expand” U.S. nuclear weapons capabilities, and has criticized the 2010 New Strategic Arms Reduction Treaty (New START) with Russia, suggesting he may be looking to change nuclear policy in significant ways. But there is no room in the budget to “expand” the scope and the cost of the upgrade plans. Though defense spending might see a boost during the Trump administration, it's unlikely to be as high as many people think. In any event, the proposed nuclear recapitalization effort is not a one, two, or three-year effort. It will require at least 15 years of sustained increased spending. Pressure on the defense budget, and the trade-offs such pressure will require, is likely to persist. The current approach also assumes that the United States will maintain a nuclear arsenal like the one it has now for decades to come. However, the Obama administration, with the support of the Joint Chiefs of staff, determined that the United States can reduce the size of its deployed strategic nuclear arsenal by up to one-third below the 2010 New Strategic Arms Reduction Treaty (New START) levels. As the projected costs for programs designed to replace and upgrade the nuclear arsenal continue to rise, Congress must demand greater transparency about long-term costs, strengthen oversight over high-risk programs, and consider options to delay, curtail, or cancel programs to save taxpayer dollars while meeting deterrence requirements. Tens, if not hundreds, of billions could be saved in the coming decades by reshaping the plans and funding a smaller number of projects, while still leaving the United States with a highly credible nuclear deterrent. My estimate of the 30-year cost of U.S. nuclear forces is based on tabulating Defense Department and Energy Department estimates in the following three categories: the cost of operating and sustain the current triad of U.S. nuclear delivery platforms and supporting command, control and communications systems; the cost to recapitalize the triad; and the cost of the semiautonomous National Nuclear Security Administration’s (NNSA) nuclear weapons activities. 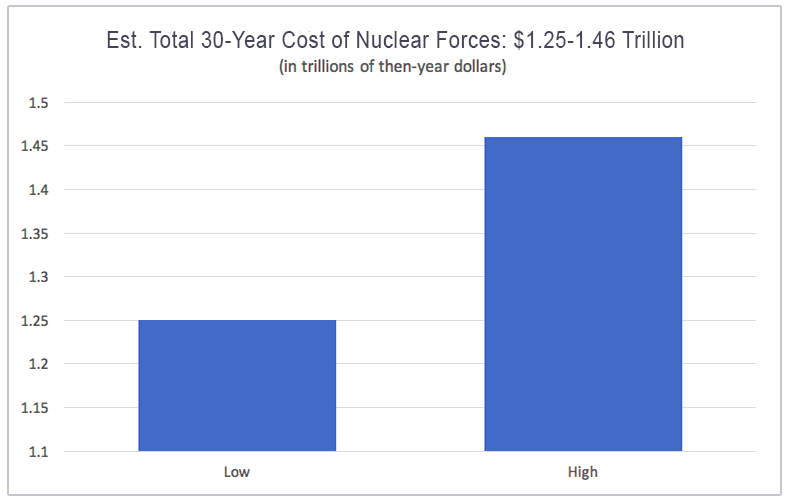 Based on the below analysis I estimate the total cost of nuclear forces from fiscal 2018 to 2047 at between $1.25 trillion and $1.46 trillion in then-year dollars, meaning it includes price increases due to inflation over the 30-year period of the estimate. In testimony to the House Armed Services Committee May 25, Robert Soofer, Deputy Assistant Secretary of Defense for Nuclear and Missile Defense, stated that the cost to sustain and operate the existing triad of delivery systems and command and control systems is $12-$14 billion in fiscal 2018 dollars. In its fiscal 2018 budget request the administration proposed to spend $14 billion on the current force. These maintenance costs would be necessary even if the United States were to forgo its plans to recapitalize the arsenal. Using $12-$14 billion as the baseline, I calculated a low and high estimate over 30-years that takes into account the impact of inflation over time. To do so I assumed an annual increase of 2.1 percent from fiscal 2018 through fiscal 2022, which is consistent with the anticipated growth rate of the overall defense budget due to inflation over the next five years as projected by the White House Office of Management and Budget. For the years beyond fiscal 2022, I assumed an annual inflation rate of 2.1 percent plus a real growth rate of 1.5 percent above inflation. The additional 1.5 percent is consistent with the real growth rate for Defense Department operation and support activities (which includes operation and maintenance and military personnel) assumed by CBO in its analysis of long-term defense costs. Based on these assumptions I estimate a low range cost of $596 billion and a high range cost of $695 billion. There are a number of assumption built into this projection that if altered could push the cost up or down. First, force sustainment costs increased from $12 billion in fiscal 2017 to $14 billion in fiscal 2018. The cause of this growth is unclear, but the increase suggests that the $12 billion figure that is the basis of my low-range estimate might be unrealistically low. Second, a real growth rate of 1.5 percent might be too conservative. Sustainment costs could increase above this rate, particularly starting in the late 2020s when the Pentagon will need to pay the cost of maintaining both legacy delivery systems and their replacements (which will begin entering service during this period). Older systems cost more to maintain as they age and newer systems typically cost more to operate when they enter service as operators adjust due to new technology. Third, the price to maintain the current triad includes more than operation and support costs: it also includes acquisition (research and development and procurement) and infrastructure costs. The price of these activities is likely to grow at different rates. Fourth, the Pentagon’s estimate of sustainment appears to include the full cost of operating the B-52H and B-2A bombers, which have both nuclear and conventional roles. Attributing a smaller percentage of the cost of these bombers (and later the B-21) to the nuclear mission would reduce the price of my 30-year estimate. It remains to be seen how many of the 100 B-21s the Air Force plans to buy will be certified for the nuclear mission. The retirement dates of the B-52H and B-24 bombers and how the cost to operate the B-21 will compare to the existing bombers are also unclear. The department is planning to spend $40.5 billion on nuclear command and control between fiscal 2017 and fiscal 2026. In his May 25 testimony, Soofer stated that the Defense Department is projecting to spend $230-$290 billion to recapitalize U.S. nuclear delivery and command, control, and communications systems between fiscal 2018 and 2040, in constant fiscal 2018 dollars. The estimate includes the total cost of strategic delivery systems that have a nuclear-only mission, and a portion of the cost of the B-21 bomber (which will have both conventional and nuclear roles) that according to the department is consistent with the historical cost of delivering nuclear capability to a strategic bomber. 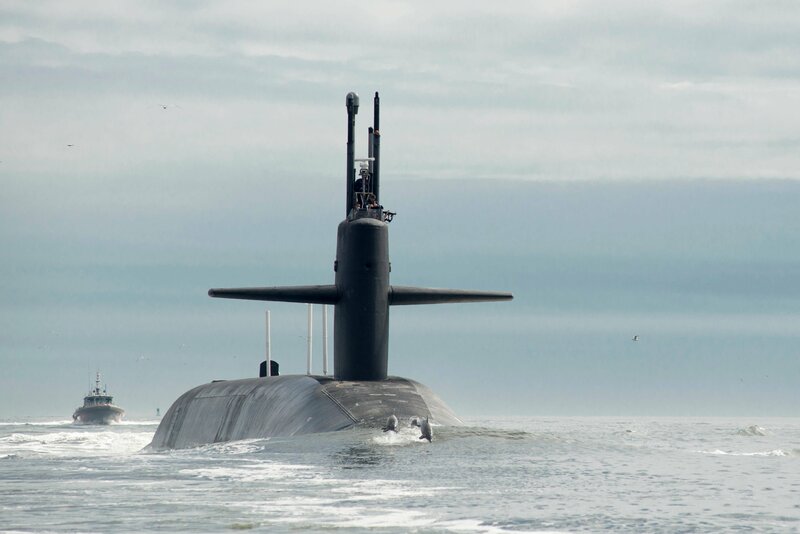 The total also includes the cost of modernizing nuclear command, control, and communications systems and an estimate to replace the Trident II (D5) submarine-launched ballistic missile (SLBM), though a program of record for this system does not yet exist. The Pentagon told me in July that this estimate does not include the costs to operate and sustain the recapitalized systems nor does it include any funds in support of NNSA’s warhead life extension programs and other stockpile activities. The Pentagon also said that when the effects of inflation are included, the $230-$290 billion estimate is equal to $280-$350 billion in then-year dollars. I was told that the range reflects “uncertainty in long-term cost projections” and that the projections will be refined in the future. Some of the department’s upgrade programs, notably the replacement for the Minuteman III intercontinental ballistic missile (ICBM) system—also known as the ground based strategic deterrent, or GBSD—are still early in the research and development phase. Most of the programs have yet to enter production. The cost range projected by the department for recapitalizing the arsenal could be understated for several reasons. First, the projection covers a period of 23 years. 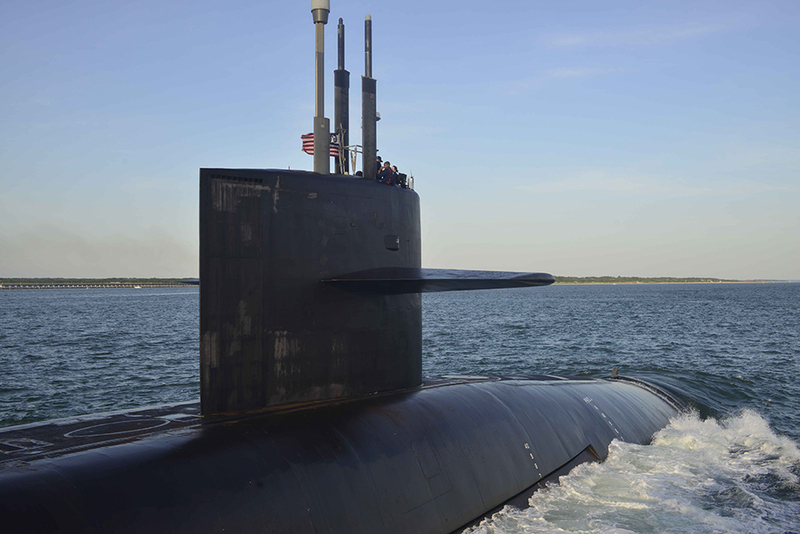 The 30-year cost is likely to be higher given that some upgrade efforts will continue beyond fiscal 2040, most notably the replacement program for the Trident II (D5). Second, the Pentagon has yet to establish replacement programs of record for the Trident II (D5) and elements of the command, control, and communications system. While the Pentagon recapitalization estimate includes a placeholder for the D5, the value of this placeholder and the assumptions behind it are unknown. Third, the department’s recapitalization estimate does appear to account for the possibility of cost increases above its current projections. However, it is not clear what accounts for the large gap between the low and high range estimate and thus hard to determine whether the high estimate realistically captures the growth potential. There is a significant amount of cost uncertainty associated with some of the recapitalization programs of record. For example, the Pentagon’s independent cost assessment and program evaluation office last year estimated the cost of the GBSD program at between $85 billion to over $140 billion in then-year dollars. Finally, the overall upgrade estimate only includes a small portion of the cost to acquire the B-21. I have been told by multiple sources that the amount the Pentagon attributes to the nuclear mission could be as low as 5 percent of the total cost. If the total acquisition cost of the program were to be counted, this could add as much as $100 billion to the inflation adjusted recapitalization projection. The National Nuclear Security Administration (NNSA) is responsible for sustaining and upgrading U.S. nuclear warheads, science and engineering programs to maintain the arsenal without nuclear explosive testing, and maintaining and replacing aging infrastructure. Since 2014 the agency has published an annual Stockpile Stewardship and Management Plan (SSMP), which includes a 25-year estimate (in then-year dollars) of the cost off NNSA’s nuclear weapons program. The most recent version of the plan was published last year and covers fiscal 2017-2041 (the fiscal 2018 version of the SSMP has yet to be released). Given uncertainties about longer-term warhead life extension and infrastructure costs, the SSMP includes a low and high range estimate. In order to calculate a 30-year estimate starting in fiscal 2018, I subtracted fiscal 2017 from last year’s plan and inflated the fiscal 2041 low and high range estimates at a rate of 2.25 percent through fiscal 2047. The inflation rate of 2.25 percent is the same rate used by NNSA in the fiscal 2017 SSMP to estimate costs beyond fiscal 2026. Based on these assumptions I project a low range cost of $369 billion and a high range cost of $417 billion. The projection for NNSA is likely too low, and perhaps significantly so. First, it does not include any funds from other NNSA accounts, such as naval reactors and the office of the administrator that directly contribute to sustaining and upgrading nuclear warheads and their supporting infrastructure. Second, the cost projections beyond fiscal 2041 do not include any real growth beyond inflation, even though NNSA will still be in the throes of conducting several large-scale warhead life extension programs. The agency is projecting to spend between $73 and $95 billion to upgrade two air-delivered warheads and develop three new interoperable warheads for use on both ICBMs and SLBMs. Third, NNSA has a troubled history of failing to control the costs of major programs, particularly construction projects. While there is some cost growth built into the high-range estimate, additional growth is probably more likely than not. 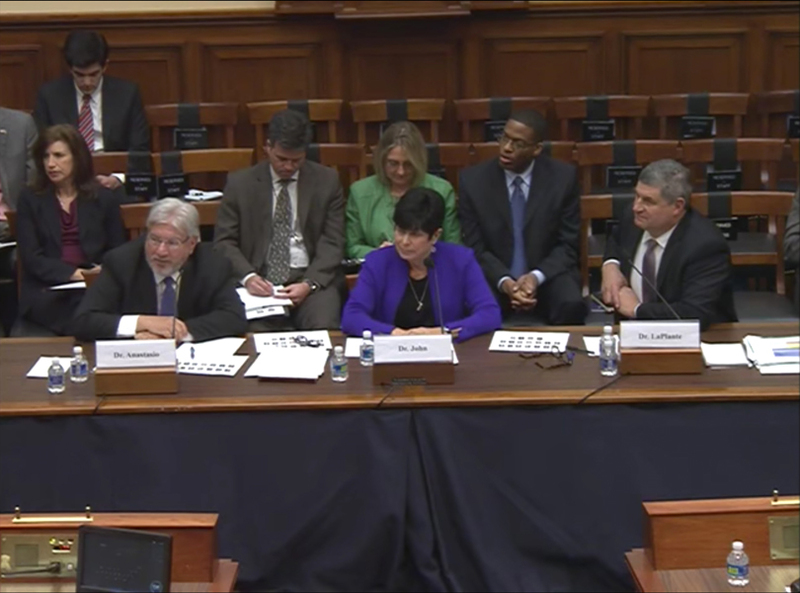 Moreover, plans for several NNSA priorities, such as sustaining plutonium capabilities and reducing the number of aging facilities that require maintenance, have yet to be fully developed and thus do not have accurate cost estimates. Finally, the long-term cost projections in the yet to be released fiscal 2018 version of the SSMP could be higher than the fiscal 2017 plan. There are a number of key differences between the above analysis and other independent projections of the long-term cost of nuclear forces. In its biennial, 10-year estimate of nuclear weapons costs, CBO attributes 25 percent of the cost to operate the B-52H to the nuclear mission, 100 percent of the B-2A cost, and 25 percent of the B-21 acquisition cost. CBO also includes a higher estimate of the cost of command, control, and communications systems than the Pentagon. Furthermore, CBO includes an estimate of additional costs based on historical cost growth. CBO is planning to release to 30-year estimate of the cost of nuclear forces, according to news reports. In 2014 the Middlebury Institute of International Studies at Monterey published a report that projected the 30-year costs of nuclear forces between fiscal 2014 and fiscal 2043 at between $872 billion and $1.082 trillion in constant fiscal 2014 dollars (though the estimate for NNSA’s weapons program appears to be in then-year dollars). The report covers an earlier time-period than the above analysis and did not assume any real growth in the cost to sustain and operate the triad. The report also does not appear to have included any projected cost to upgrade command, control, and communications systems. Read more about The Trillion (and a Half) Dollar Triad? In the absence of a coherent vision or strategy, the inexperienced new commander-in-chief has instructed the Pentagon to conduct another review of U.S. nuclear strategy, the fourth since the end of the Cold War and the first since President Barack Obama completed his own Nuclear Posture Review (NPR) in 2010. It is, however, becoming clearer that Trump’s cryptic comments about nuclear weapons, including his tweet that the United States must further “strengthen and expand” its already unparalleled nuclear capacity, are being interpreted by nuclear weapons advocates, including those who will be involved in the review, quite literally. The administration is already gearing up to accelerate the Obama-era plan to replace and upgrade each leg of the nuclear triad. The plan would maintain a force that is at least one-third larger than required and cost in excess of $1.2 trillion over the next three decades. Making matters worse, there now is a push to overturn existing U.S. policy barring the development of new nuclear warheads or nuclear weapons for new military missions in order to build new types of “more usable” nuclear weapons. In December 2016, the advisory Defense Science Board recommended the development of a “tailored nuclear option for limited use” even though board members acknowledged there is no military requirement for such a weapon. John Harvey, a former official in the Energy and Defense departments who is assisting with the Trump administration’s NPR, said at a public forum on June 29 that the United States should modify an existing strategic missile warhead to provide a low-yield option and consider reviving a Cold War-era, sea-launched, nuclear-armed cruise missile to hold Russian targets at risk. Also in June, the Republican-controlled Senate Armed Services Committee approved a proposal to authorize $65 million for research and development on a new, dual-capable ground-launched cruise missile in response to Russia’s alleged deployment of such missiles in violation of the 1987 Intermediate-Range Nuclear Forces (INF)Treaty. Proponents argue that new nuclear capabilities are necessary to provide the president with “more credible” nuclear options in the event of a military conflict with Russia. They fear Moscow may be tempted to threaten to use or actually use a small number of nuclear weapons to try to coerce the more powerful NATO to back down. That is dangerous, Cold War thinking. Once nuclear weapons are used in a conflict against another nuclear-armed adversary, even in small numbers or in a regional conflict, there is no guarantee that there will not be a nuclear response and a cycle of escalation leading to all-out global nuclear war. Despite the deterioration of relations, there is no reason why the United States should try to match Russia weapon for weapon, dumb move for each dumb move. The United States already has a significant number of lower-yield nuclear weapons in its arsenal, as well as highly formidable conventional capabilities. There is no evidence that Russia might think the United States would not have the tools to respond decisively in any future conflict. Russia’s apparent violation of the INF Treaty does not significantly alter the military balance, but it does require the United States to confront Russian officials with evidence of the violation at another meeting of the treaty’s Special Verification Commission and to work to resolve all outstanding compliance issues. Washington should also continue to support ongoing NATO efforts to bolster the conventional defenses of those allies that would be potential targets of Russian aggression or intimidation. The pursuit of new nuclear weapons, however, would represent a radical reversal of existing U.S. nuclear policy and practice, which stipulates that the “fundamental role of U.S. nuclear weapons is to deter nuclear attack.” European governments and their publics, including those near Russia, likely will not favor U.S. efforts to deploy new nuclear weapons on or near their territory, nor would the prospect of a U.S. strategy based on the threat of a “limited” nuclear conflict in their region go down well. By pursuing new types of nuclear warheads or delivery systems or modifying existing systems to create new capabilities, the United States would invite a further escalation of tensions and the acceleration of an increasingly unstable, global technological arms race. As our nation tries to turn back the tide of nuclear proliferation worldwide, we can ill afford to take actions that needlessly suggest that nuclear weapons are just another weapon in a military arsenal. The diplomatic and security costs of developing and possibly testing new types of nuclear warheads far outweigh any marginal benefits of such arms. The Trump administration, following in the footsteps of its predecessor, is seeking to end construction of the mixed-oxide (MOX) fuel fabrication plant at the Energy Department’s Savannah River Site in South Carolina, although it remains to be seen if Congress will support the proposal. The plant, which is under construction, is designed to turn surplus plutonium from the U.S. nuclear weapons program into fuel for power reactors. The administration’s fiscal year 2018 budget request, released May 23, would provide $270 million for termination costs. In addition, the administration would spend $9 million for preliminary work on an alternative plutonium-disposition path chosen by the Energy Department and its semiautonomous National Nuclear Security Administration (NNSA). The proposal is part of the admini­stration’s $1.8 billion request for NNSA nonproliferation programs in fiscal year 2018. The U.S. effort to dispose of its plutonium via the MOX fuel path has experienced major cost increases and schedule delays that put the project in jeopardy. The NNSA estimates the total construction cost of the project at $17 billion, of which approximately $5 billion has already been spent. The agency projects the annual cost to operate the facility at $800 million to $1 billion. The agency plans to spend $500 million to get the alternative approach up and running and $400 million annually to implement it. Despite the Energy Department’s efforts to terminate the MOX fuel project, Congress, led by the delegation from South Carolina, has refused to abandon it. Congress provided the NNSA with $335 million to continue construction of the MOX fuel plant in fiscal year 2017, rejecting the Obama administration’s proposal to end the project. (See ACT, June 2017.) Congress also provided $15 million, the same as the budget request and an increase of $10 million over the fiscal year 2016 level, to complete design activities for the dilute-and-dispose alternative. Excluding the MOX fuel program, the Trump administration is asking for $1.5 billion for NNSA nuclear nonproliferation and counterterrorism programs, roughly the same as the fiscal year 2017 appropriation. The largest proposed reduction in the request is to the Global Material Security program, which has the task of improving the security of nuclear materials around the world, securing orphaned or disused radiological sources, and strengthening nuclear smuggling detection and deterrence. The program would get $337 million, a $30 million reduction from the fiscal year 2017 appropriation. According to budget documents, the decline from the enacted level “reflects a commitment to reduce” unspent money left over from previous fiscal years by spending it in fiscal year 2018, permitting a lower request. The Material Management and Minimization program, which supports the removal of civilian highly enriched uranium (HEU) and plutonium around the world and converts HEU-fueled research reactors and medical isotope production facilities to the use of low-enriched uranium, would receive $332 million, an increase of $44 million over the fiscal year 2017 appropriation. Nuclear material removal activities would get $33 million, a decrease of $66 million. The drop is based on “the political and technical challenges that have delayed implementation of several removal efforts including those in Belarus, Iran, Kazakhstan, and Pakistan,” according to budget documents. Some lawmakers continue to question the wisdom of proposed reductions in funding for NNSA nuclear and radiological security activities. The Defense Science Board report drew strong pushback from Senate Democrats. Members of the Defense Science Board told Congress that the advisory group’s recent report on the potential utility of “lower yield” nuclear weapons was not intended as advocating U.S. production of such weapons. It is a sensitive issue because critics warn that such tactical weapons lower the threshold for nuclear conflict and suggest there is a viable option for limited nuclear war. Board member Michael Anastasio, a former director of the Los Alamos National Laboratory, said the panel intended only to suggest that the U.S. nuclear enterprise have the flexibility and capability to produce such weapons if a policy decision were made that they are needed. The board had tried to “distinguish between the technical capability of this enterprise versus the policy questions,” he testified. In the wake of the report, Sen. Dianne Feinstein (D-Calif.) and 12 other Senate Democrats wrote March 14 to Defense Secretary James Mattis and Energy Secretary Rick Perry expressing opposition to building a new, lower-yield nuclear weapon. “We strongly believe there is no such thing as the limited use of nuclear weapons or limited nuclear war,” they wrote. “For 71 years, the United States has led the world in opposition to the use of nuclear weapons, leadership that would be called into question should the United States develop new, so-called low-yield nuclear weapons,” they wrote. The issue is complicated by Russia’s evolving “escalate to de-escalate” doctrine, which envisions its limited use of tactical nuclear weapons during a conflict in a show of determination intended to force the United States to back down to avoid full-scale nuclear war. The report includes a reference to the doctrine in a section that examined the reasons for continued U.S. development of deterrent capabilities. Another controversial part of the report suggested that the United States may need to resume underground nuclear testing at some point to advance “scientific understanding” and ensure the reliability of the nuclear stockpile. “It is my view, and I think the view of the Defense Science Board, that we do not need nuclear testing right now,” Anastasio clarified in his testimony. The United States ended nuclear testing in September 1992 and has relied on the Stockpile Stewardship Program to maintain and modernize nuclear weapons without the need for explosive testing. Although noting the capabilities of that program, the report says that “an open question remains as to how long one can have confidence in the weapons” through this approach. The senators, in their letter, offered strong opposition to consideration of renewed testing. “We do not believe it is an ‘open question,’ as the board claims, whether the science-based Stockpile Stewardship Program and associated nuclear warhead life extension programs can maintain our confidence in the long-term reliability of our nuclear deterrent,” they wrote. The Nuclear Posture Review will include whether to maintain the long-standing goal of a world without nuclear weapons. The Trump administration’s Nuclear Posture Review will include whether to maintain the long-standing U.S. goal of seeking a world without nuclear weapons. 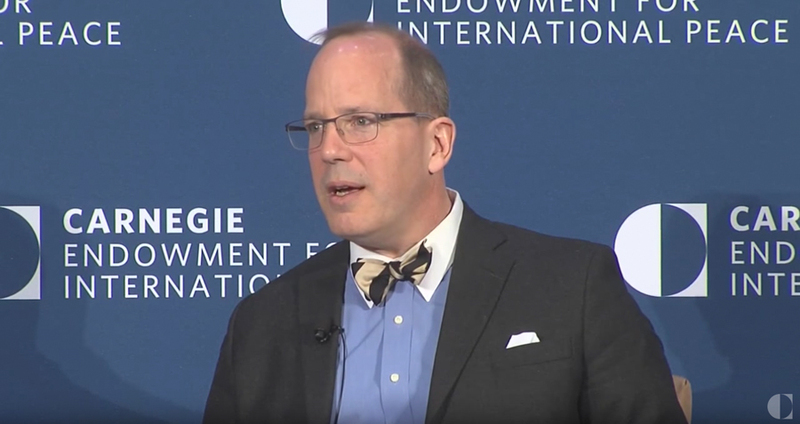 Christopher Ford, the National Security Council’s senior director for weapons of mass destruction and counterproliferation, said the review will consider whether that declared end state “is in fact a realistic objective” given current international security trends. The commitment is enshrined in the binding 1968 nuclear Nonproliferation Treaty. The United States joined the four other nuclear-weapon states at the time in committing to seek “complete” nuclear disarmament in exchange for other countries pledging not to acquire such weapons. Addressing the Carnegie International Nuclear Policy Conference on March 21, Ford said there is reason to question whether “traditional U.S. fidelity to that visionary end state...is still a viable strategy” due to various factors, including the prospect of further U.S.-Russian reductions seeming “less likely than it might have been a few years ago.” Past U.S. declarations, including President Barack Obama’s April 2009 Prague speech on disarmament, encouraged “largely unrealistic expectations and demands for ever faster process,” Ford said. The disappointments from unmet nuclear disarmament expectations contribute to the demands by non-nuclear-weapon states for the “fundamentally misguided” negotiations for a nuclear weapons ban treaty, which the new administration opposes as “fundamentally misguided,” he said.